I fell in love in the backseat of my friend’s truck. That sounds like the line to a horribly cheesy country song, but it’s true. They say you know when that moment of love hits and that moment for me was Sunday, December 4, 2011. The Denver Broncos were in Minneapolis to take on the Minnesota Vikings. 2011, more specifically late 2011, was what will go down in history as ‘Tebow Time’. Tim Tebow was doing the miraculous while being a horribly flawed quarterback. I saw ‘Tebow Time’ in person, but that’s not what I fell in love with. Young people don’t know what the radio is, so we listened to an iPod through the truck speakers for the whole 90-minute trip to and fro the stadium. Only one artist was played: Eric Church. I’d known of Eric Church. Hell, I’d seen him in concert as the opening act for Sara Evans, but he never really captivated me. I loved ‘Smoke A Little Smoke’ and I had downloaded ‘Homeboy’ from the iTunes store, but it wasn’t until December 4, 2011, that I realized Eric Church was, well, a badass. This guy captivated me the way only a couple other artists have. Eric Church captivated me so much that the next time I was at Best Buy, full disclosure I forced myself into a trip, I bought all three albums that Church had released to date. ‘Chief’, the most commercially successful album for Church thus far, was unlike any ‘country’ album I had ever heard. I say ‘country’ because Church has been quoted as saying that genres are an outdated concept. The earlier two albums weren’t as groundbreaking, but it was beyond solid typical country music. The aviators that I wore turned from being in honor of my family’s obsession with Tom Cruise and ‘Top Gun’ to being because I wanted to be Eric Church. I wanted to be that guy that was on the album cover of ‘Chief’ and wore his glasses onstage. I finally got to see the guy I wanted to be onstage again. 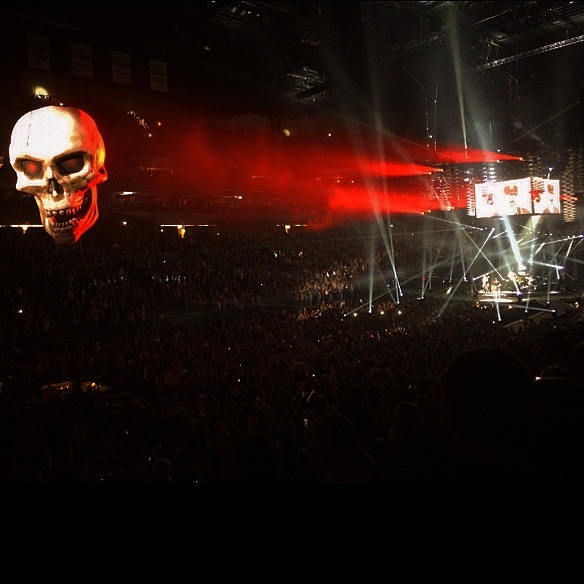 It was a ‘freakin’ Tuesday in Minneapolis’ and the Target Center was packed to the rafters. Internet connectivity was sketchy with 19,000 people and, I’d assume, 19,000 or so internet cable devices trying to SnapChat their friends. A problem I assume the Timberwolves never face. Church ran through a blistering 23 songs with only two breaks, one of those breaks was hidden behind a video montage of the prelude to ‘Devil, Devil’ which is featured on his latest album ‘The Outsiders’. The concert was heavy on ‘The Outsiders’ and ‘Chief’, but touched on all four of Church’s studio albums. Including his second single, ‘Two Pink Lines’ which was selected by a list Church gave a fan before the show and Church and his band didn’t know what they would be playing until ten seconds they were playing it. Church laughed through the song, especially after forgetting the words to the second verse of the song that reached number 19 on the charts just eight short years ago. The concert was insanely rocking, especially for what Church pointed out was a Tuesday. The energy, the all-encompassing stage, the attention of the crowd was always on Church and he gave a hell of a show off of that energy. There’s a million things a guy that is a little biased towards Eric Church could say about the concert. He did the essential hits, he did the true fans’ favorite album cuts, he tied in ‘Born to Run’ in his breakout smash spectacular ‘Springsteen’. A million memorable moments, but there is something insanely fun about one of your favorite artists having the same admiration you do for another one your favorite artists. No one was singing ‘Born to Run’ louder than me and Eric Church in that moment. I couldn’t put my finger on why I loved Eric Church so much until after the concert. I love reading the reviews of the concerts that I have just been to just so I can see how incredibly biased I am compared to the fellows that get paid to review concerts. Both the Pioneer Press and Star Tribune gave the show a thumbs-up. Both noted that the show was not the typical country concert because Eric Church is not the typical country act. Both papers compared Eric Church to other artists and that’s when it hit me. Both Ross Raihala of the Pioneer Press, a must-follow on Twitter, and Jon Bream of the Star Tribune compared Church to Bruce Springsteen. Church will always be tied to the Boss since Church’s biggest single, he’ll probably never top it, shares the Boss’ last name. Bream also threw in Garth Brooks. Eric Church is a beautiful combination of Bruce Springsteen and Garth Brooks. Musically, Church is the country equivalent of Springsteen. Springsteen had remarkable commercial success with ‘Born in the U.S.A.’ and has had mild chart success around that, but nothing ever meeting that level again. Church had ‘Chief’ and that will be his penultimate commercial success. It brought out a lot of great radio hits while being a great piece of music, but he’s going to, and intentionally, stay directly out of the spotlight. Church has said that’s why ‘The Outsiders’ is such an out of left field concept to some country music consumers. It’s real music, but it doesn’t need to be radio popular to be popular. Springsteen has built a career out of that and so will Church. One of the best songs on ‘The Outsiders’, ‘Cold One’ only got to number 20 on the charts. ‘Cold One’ is remarkable well written and performed, but is not yet accepted, and might never be, by the bro-country loving radio listeners. Church will continually sell out Target Centers and Xcel Energy Centers for a string of years and get modest airplay. Church is set music wise. Garth Brooks comes in on the performance aspect. Church had his audience captivated the whole time he was on stage on Tuesday night. No one ever sat down. I’ve only seen Springsteen once, so take this with a grain of salt, but there was a time when everyone sat down. Springsteen is a great performer and shows emotion onstage, but both Brooks and Church shove their emotions in your face, but in a very nice way. Garth and Church both continually are laughing onstage, not because something is funny, but they are both so happy they can’t help put laughing through the ear-to-ear smiles. They scream. There’s so much emotion in their shows that both Church and Brooks at times will lean back and just scream. If you saw someone do this on the street, you’d be freaked out, but onstage it seems normal. Beyond normal. Church’s music is deeper than anything on the radio, much like Springsteen. Brooks’ most commercial singles have never been insanely deep, but his show, just on DVD, is incredible. I don’t know if I saw a rock show, a country concert or if I saw a disciple of that ‘Country Music Jesus’ Church sings about, but I finally know why he’s so captivating. Church has taken the two best qualities of two of the best artists of all-time and is pulling himself up onto that pedestal with them. December 4, 2011, was a big day for me. I saw my two favorite NFL teams face off with my friends, I had my first taste of the God-send that is Chipotle and I caught the lifelong earworm that is Eric Church. I don’t know how to describe September 16, 2014. Eric Church said he’d expected we’d all have a ‘religious experience’ on Tuesday night. If that was ‘religious’, I’m going to be in the front pew of Church until the world burns down.